A friend of mine suggested me to do some animated planet stuff with CSS. I gave it a go and ended up with a kinda-cool animated planet Earth. I had this one in my local playground as yet, but today I’m going to share it online right here. Before going any further, I want to tell you that I have made it look like 3d-earth and used CSS3 keyframes for the rotating animation. You must see the demo before we jump into the code mess. This idea demands a realtime rotating sphere, which is not possible in CSS. But a lookalike is doable, all you need is to throw some CSS ingredients into a div and there you go. For animation, I’ve used a small CSS keyframes trick that makes it appear lively and rotating. It’s just a single div, trust me. Will play with :before and :after of #earth in the next section to add some detailing. Now comes the important part, the styling. I added some width and height to #earth, and then gave it a background-image similar to flat earth map. 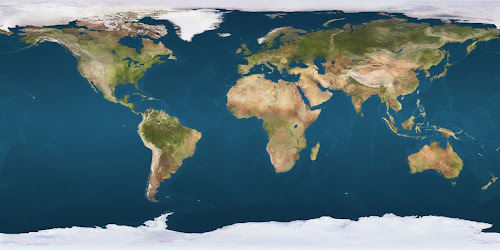 Here’s the small preview of our flat earth map I found on the internet. Our #earth is relatively positioned. To make it appear spherical, I added a 50% of border-radius. Detailing of our earth as a 3d object has been done in 3 layers which is covered below step-by-step with some CSS code snippets. The :before and :after of #earth are absolute positioned, and carry same height, width and border-radius as the main element. I’ve fixed the background-size of our earth to 630 pixels to fit the image perfectly inside our #earth. I come up with this number after a number of adjustments. Now comes the animation part. Our earth map image is very wide. Our #earth element is of 300x300px, hence it shows earth map under 300x300px only. Now if we linearly move our background from 0 to 630px of horizontal position, we can give #earth a rotating animation effect. I’ve implemented this with the help of CSS keyframes. If you put everything together, preview below the results you’ll be getting. On the demo page, I’m using a background image for the body to make the environment look like space, just a few stars repeating over-and-over-again as you can see in the background. I wanted to add curved and blurred edges to our earth but that’s not doable with the technique I followed – as far as I know. Hope you enjoyed this article. Let me know your thoughts on this. Cheers!